It's true that not everyone can qualify for Olympia or Crufts but there's an extra 'fun run' qualifier for every Grade level now, not just the Advanced dogs. You can find a heat of a qualifier near you by using the Qualifiers button on the Show Diary page. Don't be shy. Go for it. Longfield Agility Solutions has launched a new fun event for handlers aged 50 who could no longer run as fast backwards as they could run forwards. The Grampion Agility Championship qualifier will be a special class combining G1-7 and will combine the results from all heights. There will be a Gramp agiity round and a Gram Jumping round with points being awarded from 20 for 1st place down to one in each round. There will be no points awarded for elimination but that will not stop you from qualifying for the Final. The top 20 handlers will go forward to compete in the Grampionship Final. Points earned in each round will be entered into the CLS Massage Grampions League with the top 30 dogs being invited to complete in the League Final on Saturday, 17th April at the Longfield August show. Handlers, aged 65 or over, should make Show Secretaries aware as they will be awarded separate points for T'owd Codgers Cup League. The winner will be announced on `7th August 2019. There will be heats at every Longfield Show, Hoolihounds, Maidstone (June) and Stardom (May) are hosting one and possibly some at the Hare 'n Hounds shows, too. Crystal Vision Awards have very kindly sponsored the heat winners trophies while the August Final is being sponsored by CLS Sports Massage who expertise could come in very handy. Agria Pet Insurance will support the Agria Agility Challenge in 2019. With its regional heats for dogs at Grades 1- 4, this competition is for standard height Large dogs during the spring and summer, culminating in a thrilling final in September in the Top Dogs Arena at The Malvern Autumn Show. As in previous years, there will be six qualifying heats for CG1-4 and CG5-7, for dogs competing at 550mm (KC Large LHO). The top two in each will claim their spot - but there are even more chances to qualify this time, with an extra 'last minute' heat on the same day as the finals the Weslo Show on Saturday, 10 August. The fabulous trophies and rosettes at the heats and finals are being sponsored once again by the SMART Veterinary Clinic. The 2019 competition will also see fantastic prizes for each final winner of a 3m pipe tunnel awarded by Wes Lo K9, and a space at a guest trainer workshop run by Train in the Ring for the runners up! It is with much regret that it has been decided that the CSJ Highland Agility Stakes will not be run in 2019. The final is traditionally held at in the Main ring at the Scottish Game Fair at Scone Palace as a main ring event but unfortunately this year this event clashes with East Lothian championship show . Organiser Lisa Duggan said, 'With the generous support of CSJ, the event will be back in 2020. East Lothian has been able to confirm the dates won’t clash in 2020, so we plan to run it again in 2020 with the introduction of the fourth Intermediate height qualifiers and final. Thank you to CSJ and Ceri Rundle without whom this event wouldnot happen and all the clubs that agreed to host heats - Woodside, Kingdom of Fife, Scottish Border Collie Club, Fair City and Gleniffer. Apologies for the late notice but we were exploring alternatives once we realised there was a problem. Now that we know what is happening with future dog/jump heights we can announce that the Showtime Novice Cup will continue for 2019 under the established format. However, 2020 will see a complete revamp. This will remain an agility competition for dogs of Grades 3 - 5. There will continue to be six qualifying rounds but, in 2020, these will expand to include all FOUR heights. Adams Agility has announced a prestigious new competition for 2018. The Blenheim Palace Horse Trials Dog Agility Stakes will be open to Large dogs (full height only) G1-7. It will be held under under the appropriate Kennel Club Regulations H & H(1) in force at the time of the event and consist of five qualifying heats at various shows around the country. The top three previously unqualified dogs from each heat will qualify for the Final comprising of a minimum of 15 and maximum of 20 dogs. The Final, judged by the much loved Charlie Wyatt, will be held at SsangYong Blenheim Palace International Horse Trials on Friday, 14th September 2018. For a list of Blenheim Palace heats, go to the Agilitynet Show Diary or Qualifiers News page. The final will consist of one round of Agility which will be judged under the appropriate Kennel Club Regulations H & H(1) in force at the time of the event. Competitors entering any of the Heats will be deemed to have agreed to abide by KC Rules as specified above. All heats must take place at Kennel Club licensed shows and the class name in the schedule should replicate exactly the name of the competition as stated in these rules. If the entry for the heat exceeds 400 the class must be split into two equal parts, with the top two previously unqualified placed dogs from each part going through to the final. If the entry exceeds 600 the class must be split into three equal parts, with the highest placed previously unqualified dog in each part going through to the final. Rosettes and trophies remain unchanged if the heat is split and will be given for each part. Handlers may enter more than one dog in the competition and may qualify more than one dog for the final event. Qualifiers may enter further heats for competition, providing they are eligible. Handlers who gaina qualifying place in a heat with a previously qualified dog should inform the Show Secretary on the date of the show of this fact. In the event of a dog and/or handler being unable to compete in the Final due to unavailability, illness or injury the reserves from that heat will be called up in numerical order. Rosettes will be provided to 20th place, and trophies to 3rd. The Animal Health Company is delighted to announce that it will be continuing its Agility competition in 2018. 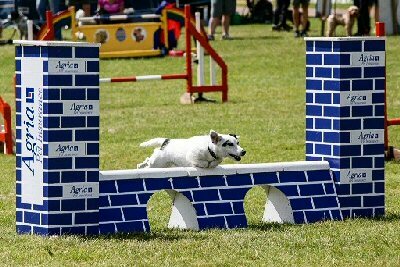 The competition is open to all sizes of Agility dogs in a steeplechase style course that features the Westcotts Water Jump! With qualifiers across the country, there are 12 opportunities in 2018 for the top five to join us at the autumn final to seek a share of over £100 of prize money. The Animal Health Company offers a range of products that will be ideal for the Agility dog including their new food, Westcotts. Unique to the market, it contains HypercCoat Prime, a popular supplement. Westcotts it is formulated with high levels of chicken and rice, is hypoallergenic, pro biotic and has no added flavourings or preservatives produced from quality ingredients helping dogs with a sensitive palate. For a list of heats go to Animal Health Co page or the Agilitynet Show Diary. Agria Pet Insurance and Country Shows Agility are delighted to announce support for the Agria Brillo Bounce competitions in addition to their support for a full programme for Large dogs. The Agria Brillo Bounce competitions are specifically for Small and Medium dogs. Heats will take place across the country throughout the 2017 season and culminate in the finals, due to be held in October at the British Agility Championships in Bedfordshire in October, kindly judged by International Agility Judge Jorge Pires, using KC Agility rules. From each of the 12 qualifiers at each size, the top three at each dog size will receive an invitation to attend the Final. Each final will consist of two untimed rounds - one Agility and one Jumping - for each size of dog with the maximum course time specified. All double clears will go forward to the Final. In the event of no double clears at either size, a maximum of ten dogs with the minimum combined faults will be selected. All double clears will compete in the final round which will be a jumping round against the clock to find the 2017 Agria Brillo Bounce winner at each size. Classes will be judged using current Kennel Club rules, and each host venue has chosen which grades are included for each size of Agria Brillo Bounce qualifier. All will run at standard heights. For a list of heats go to Agria Brillo Bounce page or the Agilitynet Show Diary. Northernaloe.com are proud sponsors of the Northern Aloe ABC Agility Challenge, a new competition for all Large dogs Grade 1-7 excluding Border Collies, Working Sheepdogs or their crosses. Peter Kemble said, 'We have an ABC dog and, as there are not many specific ABC competitions, we thought it might be fun to sponsor one. Longfield - 30 March to 2 April. The first five dogs from the heat will be invited to compete in the final. The next five dogs will be held as reserves. If the class is split the top three dogs from each part will be invited to compete in the final and the next three will be held as reserves. The competition must be judged under the appropriate Kennel Club Rules in force at that time for a standard open class. Northernaloe is a business created by Hazel and Peter Kemble in 1997 as business owners of Forever Living Products. They supply high quality consumable products in the health and well-being many based on Aloe Vera providing the benefits of this remarkable plant to both animals and their owners which have been recognised for over 5000 years. Their business model provides an opportunity for all to establish a substantial independent income working flexibly from home. They currently have openings for new business owners who will be fully trained and supported. For more information and an informal discussion, please contact Peter at peter@tttgroup.co.uk or call m. 07831 238024. Agility Rocks, Dogs Matter and PAwS Shows have teamed up to bring you The UKA South West Winter Finals. We want to celebrate Agility in the South West and hope that this event will allow the best of the best in the South West region to compete against each other – and will provide an opportunity for handlers and dogs at all levels to prove themselves. You can qualify for the finals at various shows throughout the winter. The Dog Vegas Team has announced some exciting changes to the Dog Vegas Finals for 2018. PB Caravans has agreed to support the all new 550mm height Grade 1-5 Jumping heats for the 2018 Finals. This competition will be open to Large dogs who want to run at the new 550mm height. There will be 10 heats throughout the year, culminating in the finals at the Dog Vegas July 2018 show. 07549 794827. All of the heats will be available on the Dog Vegas website once details have been confirmed. The Paws Trading Large Grade 3-5 heats will soon have a new name and a new sponsor After many years of supporting them, Paws Trading will be bowing out of that competition but supporting the Dog Vegas All Sorts classes instead. Quill Trading will be taking over the 3-5 heats heats. Nothing will change about the heats or the final, apart from the name. A complete list of all of the heats will be available on the Dog Vegas website when they have been confirmed. Hazel Higgins, David Bew and the entire Dog Vegas team would like to say a massive thank you to all of our sponsors without whom we couldn't run these heats and finals.